The wind buffeted our little tent relentlessly all night making sleep difficult. It was, and still is, forecast to continue until the weekend. I let myself be persuaded, too easily perhaps, by the chap who looks after the campsite that my planned ride to Jedburgh would be into the wind all the way, and terribly hard. In the course of a long discussion about all things, which involved a welcome cup of coffee in his hut, another chap arrived and concurred with the advice to stay put till the weather improved. 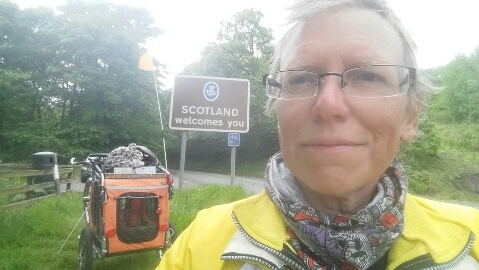 I’m not sure they were right about the headwind, and I was determined to get to Scotland today, but I certainly was tired. 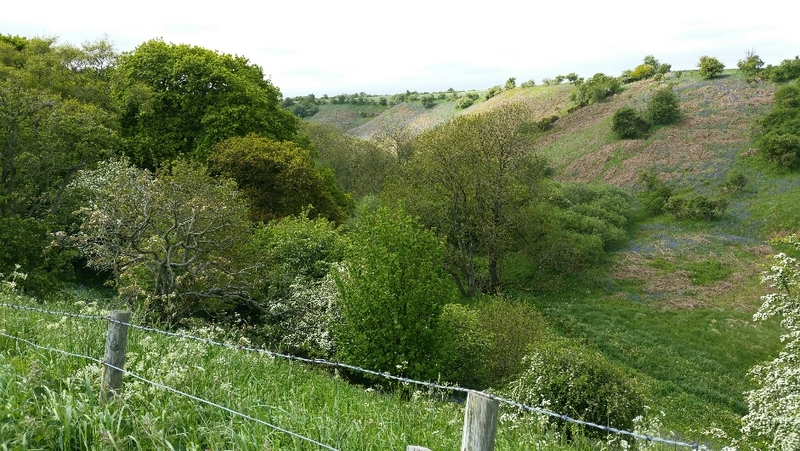 Anyway, after a visit from some cows, who seemed to enjoy Raisin’s barking, we set off to explore the environs on foot, finding a babbling burn and impressive, purple sided gorge right on our doorstep. Then we rode the 7 miles or so to the village of Norham, laughing at how easy the hills felt with no luggage to haul, with just Raisin in the trailer, headwind or no. A couple smoking outside the Queen Victoria flagged us down for a chat about the trailer and what we were up to, pointing us in the direction of the village shop and of Scotland. 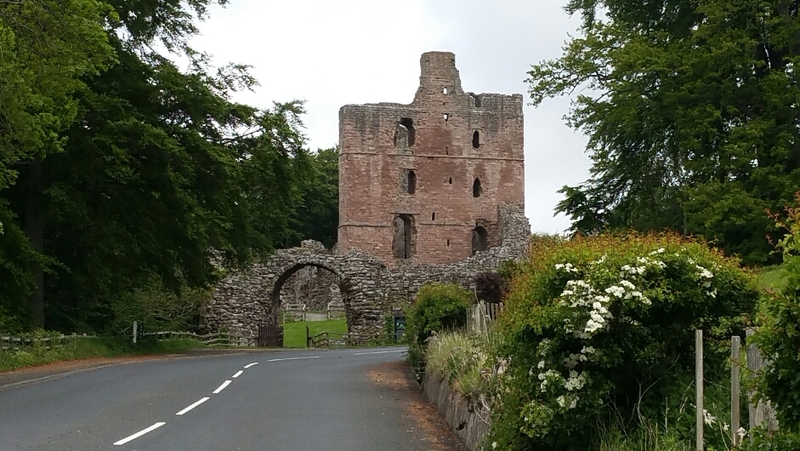 We also saw Norham Castle, defiantly giving its northern neighbours the finger after being besieged by the Scots many times over the years. 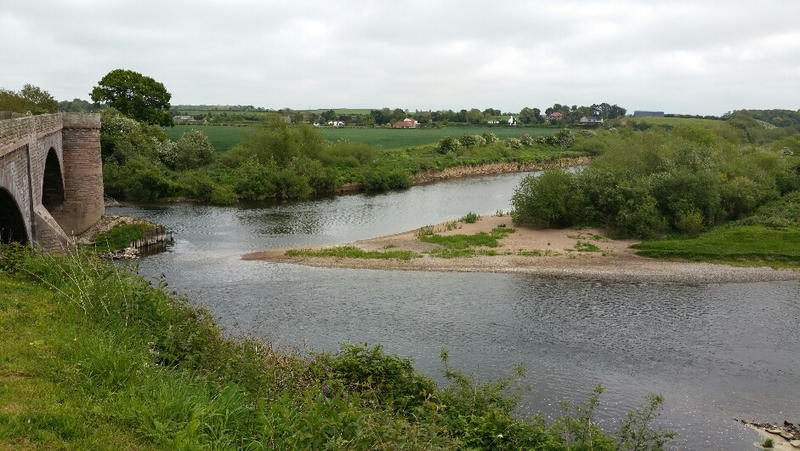 The border with Scotland here is the river Tweed, and Norham has a fine bridge spanning it. The island in the middle (‘no man’s land’) would be a tax haven, the chaps at the campsite had told me, if the owner wanted to build a house on it. But it’s a bit prone to flooding…. To celebrate reaching Scotland at last, we went to the Mason’s Arms back in the village for lunch and found our new friends from ‘the Vic’, Pockets and Cobey, we’re there. Pockets (excellent nickname; real name Lesley) told everyone in the pub that I had cycled from Suffolk with the wee dog and declared me a hero, which was nice if somewhat embarrassing. So it’s good to have got this far but I am still pondering the next move. Route 1 goes inland now, East then North to Edinburgh, and Jedburgh is the next campsite in that direction, which puts us into the hills I think. Or, as I only realised today, Sustrans Route 68 continues up the coast, where Dunbar is the next campsite and where I have the offer of a place to stay a bit further round in North Berwick. But the wind will make that 35 miles difficult. I’ll (try) to sleep on it. 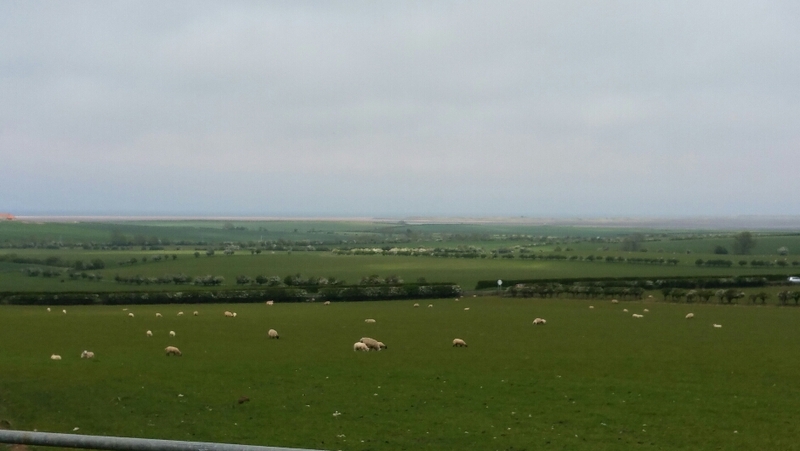 It was a tough ride from Beadnell to Ancroft (just south of Berwick upon Tweed) today – mist, drizzle and a strong headwind combined with lumpy roads to make it heavy on the heart and legs. On a fine day the views would be super, but our only glimpses of the sea were monochrome and smudgey, even when the sun did eventually appear. 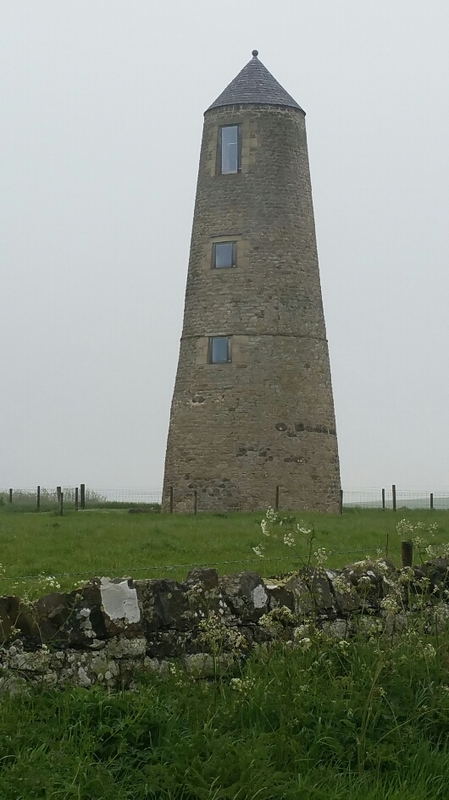 A converted windmill loomed out of the greyness at the top of a climb in East Kyloe (I think). A strange place to live but you must be able to see for miles from the top on a clear day. 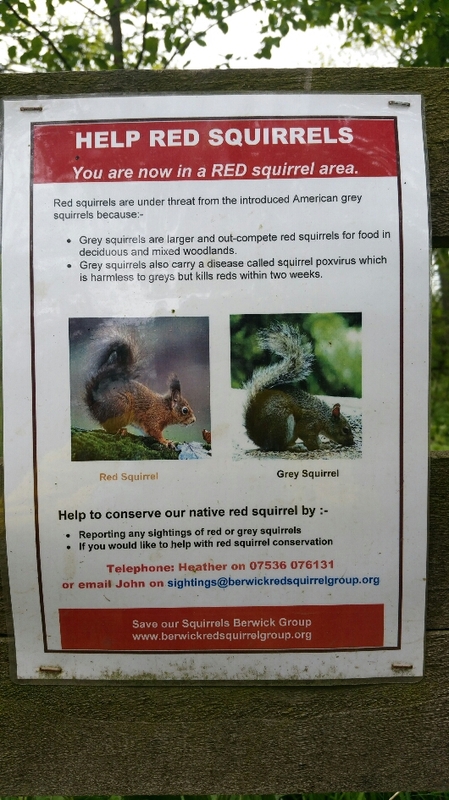 We stopped for picnic lunch at some woods in Detchant and I was delighted to see a notice about red squirrels. How exciting to be in red squirrel country! After that, there were lots of signs on the road asking people to slow down for them. The sun lifted my spirits as we set up camp in another Camping and Caravanning Club ‘Certified Sites’ – small privately owned ventures that tend to be off the beaten track. This one has good facilities and is quiet if a bit impersonal and expensive (£15). Still, I got some washing done and the wind has dried all the kit wet from this morning. The north wind is still blowing hard and cold, but it’s been a nice evening all the same. Tomorrow, at last, we will cross the border into Scotland as we head inland for Jedburgh. Cold again today, and Raisin and I had a nice post-breakfast cuddle in the tent to warm up before starting our rest day in earnest: a walk to Seahouses; slap up lunch; miscellaneous maintenance tasks. The first task was completed early when mobile mechanic Mark Breeze arrived by bicycle (on a 50 mile training ride) with two inner tubes for the trailer. One was wrecked yesterday when I didn’t notice the puncture until we’d ridden with a flat tyre for a while. My support crew back at home had magicked up these spares, unbeknownst to me. Marvellous. 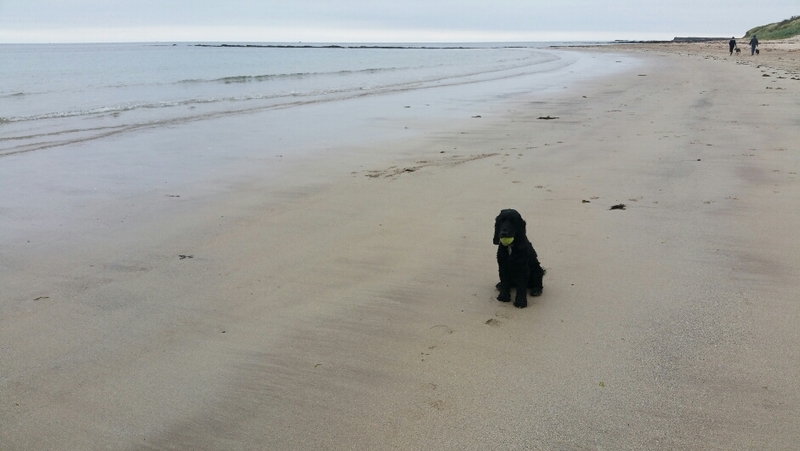 We headed north along the beach from Beadnell but didn’t get far before Raisin refused to go on. She sometimes does this in the Butter Market back home in Bury St Edmunds, about 4 minutes into our morning walk and we end up going home. I have no idea why. 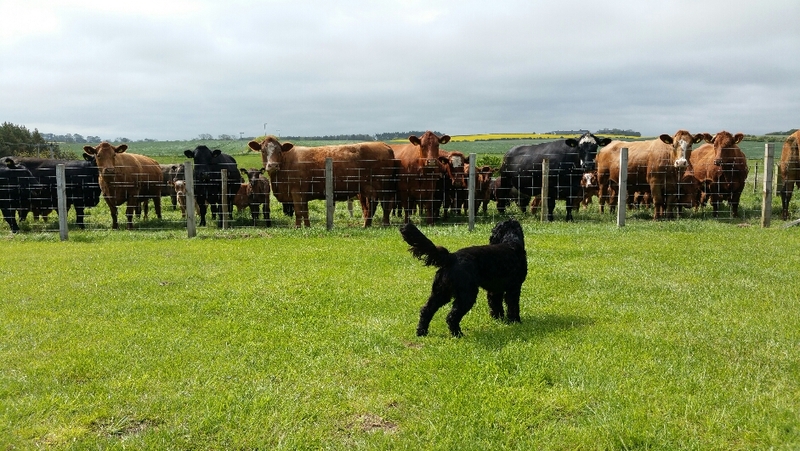 Some other dogs arrived whilst we were in negotiations and, distracted, she forgot her stance and we carried on. 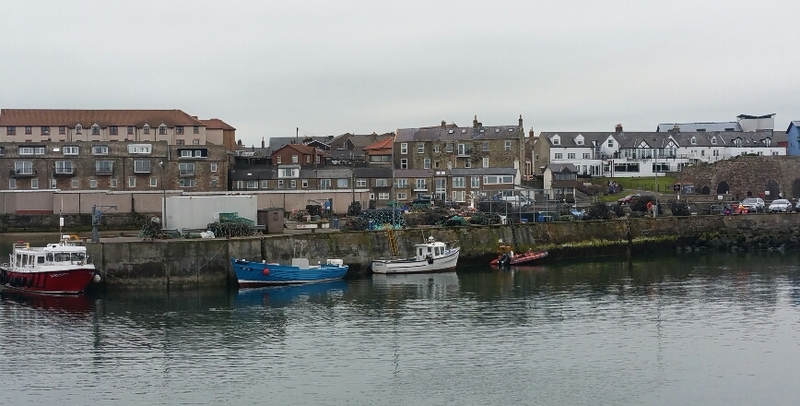 Seahouses was busy with visitors shopping and wandering around and deciding which boat trip to take to the Farne Islands to see seals and puffins and guillemot. I decided it was just too cold for boat trips and so we went in search of a warm dog friendly cafe. When that proved unsuccessful we continued walking along the beach, towards Bamburgh, where plenty of others had the same idea. It was good to see lots of dogs enjoying the great expanse of smooth, flat running surface. Something about the family groupings, and the winter clothing reminded me of those Boxing Day walks people do with their guests to get out of the house. By this point I was feeling shaken up by slipping on some seaweed and crashing down on a rock, landing on my arm and shoulder. The pain made me terrifically hot, nauseous and light headed. Last time I felt like that I had just given blood and passed out mid-recovery biscuit in the Athenaeum, which was a good place to do it, being 50 yards from home and surrounded by phlebotomy nurses who see it happen every day. Here though, I feared cracking my head open and/or drowning in a rock pool if I fainted. So I lay down for a little while to help some blood to my brain whilst nurse Raisin licked my face. We turned back before Bamburgh, buying fish and chips in Seahouses to eat on the edge of the golf course, overlooking Beadnell Bay. Back at base, with 8 miles walked we had a nap and I failed to do any more maintenance tasks whatsoever, pondering instead on my good fortune not to have broken any bones today.